Everything about Lemmie Ferguson’s life is bright, shiny and sunny. It’s because she looks at the world in her own special way: a vivid, rainbow-hued, magical way. Lemmie’s big sister – spontaneous, sparkly Rose Rouge – calls it marshmallow magic. But there’s a dark spot in Lemmie’s life, and when a primary-school rival comes back to haunt her, the dark spot starts to grow. Now Lemmie’s marshmallow magic doesn’t seem to be working anymore. She needs to call on her sister, Rose Rouge, and her special rose-tinted spectacles… but can Lemmie count on Rose when she needs her the most? i really want to read this but i’ll have to buy it coz school ain’t got it. My friend Charlie[girl] reads all of Karen McCombie’s books!!!! this book is excellent! i am still reading it but am nearly finished it because i have been reading it so much! 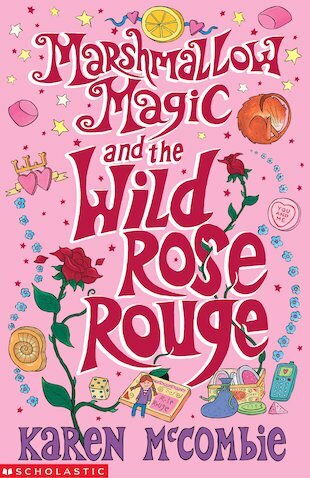 i am soo getting another of Karen McCombie’s books. i fink this book is sooooo like just me.. thats why im looking forward to read this book…. i hav’nt reed this book yet!! !